After some time in Massachusetts, we headed to my folks home in central Pennsylvania. It had been rainy and the local flows were high, but clearing. So, Mary May and I took a day to hit the streams in hopes of enticing some giant trout. We decided to start on Penns Creek, chasing native brown trout in an area I have been fishing since I was a kid. She started with a husky jerk and I a YoZuri Twitch'N Minnow. It didn't take long before I had my first bite, but the fish threw the hook...easy come, easy go. I lost another fish - a long, slender brown trout - right at the bank, before finally landing the first fish of the day on a #2 Blue Fox spinner. He wasn't big, but he was a start. But after that fish the bite slowed a little and around the next bend we found more fishermen, so instead of fishing around them we headed to the car. I had another spot in mind where I have had luck during the winter months. As we wound along the creek road, I was shocked to find fishermen in that spot as well. I know 45 degrees is warm for late December in PA, but everyone was out on the water. No matter, we again moved further upstream to another location. It was a small riffle and pool, worthy of about 15 minutes of our time. We cast at every feasible angle with no luck, so I walked the 15 yards toward Mary May to tell her it was time to move. No sooner did I reach her then she got a bite, but a miss. Thankfully, the fish came back for seconds and nailed her crankbait. Her first ever PA trout was in hand! At this point, I was tired of dealing with the "crowds" so I headed to another native trout stream that is near and dear to my heart. It wasn't long before I landed our first fish from the new creek. The brook trout (our only non-brown trout of the day) wasn't a head turner, but the state fish of PA was as beautiful as ever. We worked our way up the bank of the small stream and it wasn't long before Mary May had the next fish. Over the next couple of hours, we caught a pile of fish ranging from 10" to 16". Fish were hitting spinners and jerk/crankbaits. We even managed a double. It was a great time on the water that kept us smiling from start to finish. The aggressiveness of mid-winter trout is hard to beat - especially on ultra-lite gear. Despite our love of fresh fish, all of the trout were released unharmed. Until next time, tight lines.......and keep your fish gripped tight! 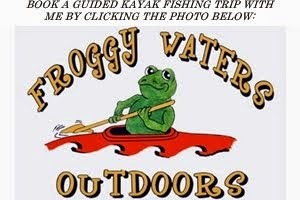 Just found your blog, I see you are a fellow kayak angler. Glad you got your first of the year and I look forward to seeing many more from you. Thanks Daniel! You have a great looking blog yourself (which I followed). As a food lover - especially a German food lover - the recipes literally had me salavating! Congrats on your fine start to 2012 with the Kings River bass. Tight lines! Hey Drew. Just happened across your blog and realized who it was. Enjoyable reading to say the least. Also, I'm 99% sure I can pinpoint the exact location the last 3 pictures in this series were taken... Have always known that section of creek to usually be good for at least a couple pretty browns or brookies, albeit I have not be back there for close to ten years.